From early military history to the present time, the use of terms like soldier’s heart, shell shock, war neuroses, combat heart, and the invisible wounds of war point to the toll that combat takes on the physical and mental well-being of warriors and their families. 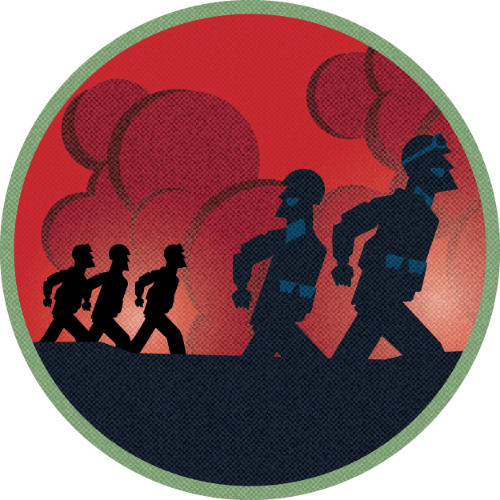 There is no doubt that the profound experience of war can change an individual in many ways, and for some, impair their quality of life, productivity, and stability. Why We Have Chosen to Drop the "D"
Post-traumatic stress disorder (PTSD) is the clinical term for an injury that can result from the experience of war. While the medical profession has defined criteria for diagnosis and eligibility to care for this injury, we at the Bush Institute dropped the "D" (or "disorder") because we have found the term can serve as a barrier seeking care and contributes to stigma. Addressing the invisible wounds of war – post-traumatic stress (PTS) and traumatic brain injury (TBI) – is a core issue for warriors, their families, and their communities. Misperceptions around these wounds abound. And there are real consequences to the stigmas and stereotypes: a recent study by the Bush Institute found that over 80% of post-9/11 veterans thought that embarrassment or shame was a barrier to veterans seeking care for their injuries. But issues -- such as access to quality care -- also result in many warriors not seeking or staying in the care they need to heal. 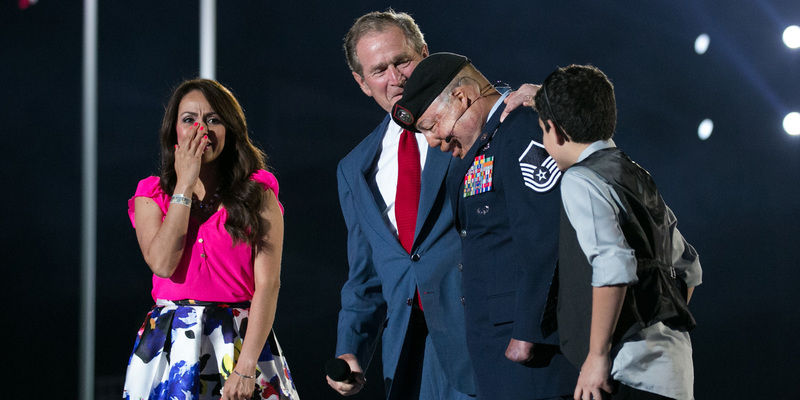 The policy work of the Bush Institute’s Military Service Initiative is grounded in a core belief of our responsibility as a nation to honor warriors and their families, and empower them to continue to serve as national assets as they transition from military service to civilian life. With the support of their families, communities, fellow citizens and non-profit organizations, warriors can continue to lead and serve in new and meaningful ways. With the support of their families, communities, fellow citizens and non-profit organizations, warriors can continue to lead and serve in new and meaningful ways. Left untreated, the invisible wounds of war can serve as a significant barrier to a meaningful and productive life. Most service men and women return home from combat without injury, or readjust successfully without intervention. But data shows that the number of post-9/11 warriors who come home from war with an invisible wound is higher than historical rates. While this may be due in part to under-reported injuries in past conflicts, studies estimate that at any one time, approximately 10 - 20 percent of service members who have deployed in the post-9/11 conflicts have symptoms commensurate with a diagnosis of PTSD, and an additional percentage may experience some other mental health condition like depression or anxiety, in some cases along with cognitive impairment, most notably mild TBI. Because each warrior’s experience is unique, the injury they develop in theater, and the severity of that injury, depends on a series of factors. In fact, for some, manifestations of the invisible wounds of war may not occur for many years. One thing is certain-- left untreated, the invisible wounds of war can serve as a significant barrier to a meaningful and productive life. Studies show that untreated or inadequately treated invisible wounds can lead to longer-term consequences such as impaired health, lost work, reduced quality of life, homelessness, domestic violence, family strain, substance abuse, and suicide. While it is possible to estimate the direct economic costs associated with these consequences, the human toll in potential illness and suffering may be incalculable. Moreover, the consequences can ripple outward from the veteran to his or her family, friends, colleagues, acquaintances, and society. Studies show that many non-VA medical practitioners are not comprehensively trained in the invisible wounds of war. Within the United States, warriors receive care through three major healthcare systems: the Department of Defense’s Military Health System (MHS), which includes TRICARE; the Department of Veterans Affairs’ health care system; and, the private healthcare system. With so many options, it can be difficult for warriors to understand the provider coverage available to them at different phases of their lives. 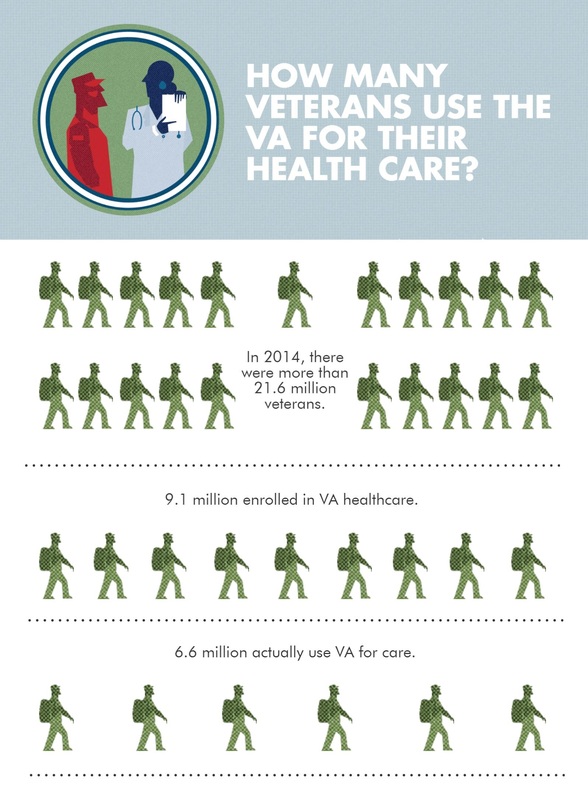 Currently, large numbers of U.S. veterans rely upon non-VA sources of health care, either because they are ineligible for VA benefits, or because they choose to use private and community providers, placing a significant responsibility for the health of our nation’s veterans outside of the VA system. However, studies have shown that many of these practitioners are not comprehensively trained in providing effective treatment specific to the needs of the military and veteran population, especially when it comes to treating the invisible wounds of war. Goals: Increase the number of veterans in effective care; improve the delivery of high quality care; advocate for investment in research that leads to more effective diagnostics and treatment; and decrease the stigma and improve understanding and acceptance of the invisible wounds of war. In order to fully support the post-9/11 military community, it is critical to connect veterans to effective services for treating TBI, PTS, and other psychological health conditions. We must also reduce the barriers these injuries pose to successful transition, and the effect they have on employment, education, and a meaningful family life. With effective treatment, invisible wounds can be overcome. As a Nation and as individual citizens, we all have a responsibility to ensure warriors who face the invisible wounds of war are empowered to seek, access, and receive high quality care. In early 2016, the Bush Institute outlined three primary pillars for action: Recognize, Connect, and Deliver. This framework provides a foundation for recommendations that will best support warriors as they seek, receive, and stay in comprehensive, high quality treatment for the invisible wounds of war. These recommendations are aimed at policy makers, health care providers, the research and pharmaceutical industry, post-9/11 veterans and their families, and the general public. A sea of good will exists around this effort, and a proliferation of efforts have been designed to address the problems, but bridging the gaps that persist will require a coordinated and cohesive effort by all of these groups and individuals. 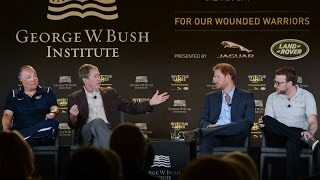 President George W. Bush and His Royal Highness Prince Harry are joined on stage to discuss invisible wounds by LCpl John-James Chalmers, United Kingdom and MSgt Israel Del Toro Jr., United States Air Force (Ret.). Decrease barriers due to eligibility and affordability. To receive care through the VA or DoD, veterans must meet certain eligibility criteria. Veterans not eligible for care in these federal systems may receive care through state-funded community health centers, employer sponsored health plans or other non-profit providers. Over the past decade, there has been a growing recognition of the need to provide care for veterans outside of the VA, resulting in an increase in philanthropic support to create and sustain low- or no-cost community-based care opportunities specifically focused on treating PTS and/or TBI among post-9/11 veterans. While these programs offer a unique opportunity to serve veterans with PTS and/or TBI as well as their families, they are to a large extent reliant upon philanthropic support to sustain their operations. Improve Availability and Accessibility of Care. Too few providers have the appropriate training to detect, treat, and manage the invisible wounds of war. Successful efforts to increase the workforce within the DoD and VA have created new challenges for ensuring a robust pipeline and distribution of providers within the entire system of care. Given these capacity constraints, the use of telehealth has become increasingly important to delivering care to those who live more remote from existing expertise and capabilities. Address Stigma as a Barrier to Care. 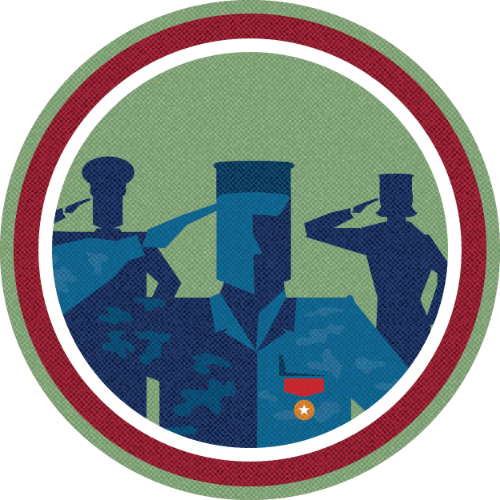 It is important that the environments veterans return to after their military service, like work places and educational setting, are supportive and understanding of the invisible wounds of war, and that veterans feel confident that connecting to care will not negatively impact their ability to find or sustain a job or education. Access to appropriate assistance programs, counseling and other support programs, and referrals to care settings can help facilitate care seeking with early interventions. Improve Navigation and Referral Processes. Finding the right care can be challenging. Navigating through the multiple options can be confusing – in the past decade, care programs have multiplied to the hundreds, which makes it difficult for even the most motivated veterans and caregivers to identify which programs will work best for their needs. To simplify and clarify the pathways to high quality care, we must work to improve awareness of and access to available programs, benefits, and services available for veterans and their families. This must include those available at all levels and across all sectors, as well as information about the impact or outcomes associated with the services so that veterans and their families can make the most informed choices. Finally, the creation of formal coalitions or alliances among existing community based resource directories or navigation platforms could serve to create standards of practice and share lessons learned, in an effort to more concisely meet veteran’s needs. Improve Screening for the Invisible Wounds of War. 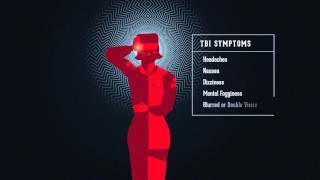 Within the VA health care system, the implementation of standardized screenings for TBI and exposure to traumatic events has increased the detection of invisible wounds and referral to care. However, not all veterans with these injuries seek care in the VA, requiring the expansion of appropriate screening and assessments into the community-based, private healthcare sector. We must also improve how primary care providers understand and manage TBI to improve the integration of neurological and cognitive rehabilitative approaches into existing treatment. To ensure that veterans receive the most effective care, we must address the system of care itself, including workforce shortage appropriate skills training, and cultural competence. Expand Access to Expertise by Leveraging Technology. Technology presents a powerful opportunity to link providers to information, resources, and expertise. Technological platforms can be utilized for screening and assessment, for consultation, and for treatment itself. Web-based platforms for screening and assessment and self-management may also be helpful to people who are not yet ready to start formal treatment, and telehealth models provide care to warriors with geographic and/or logistical constraints. However, to fully optimize the use of technology and opportunity that telehealth brings, licensure restrictions working across state-lines need to be addressed. Equip and Train Existing and Future Healthcare Workforce. There have been many efforts over the past decade to improve the awareness of military-related PTSD among the civilian mental health workforce. Whether it be on-line webinars or in-person training classes, a number of organizations offer training in military cultural competence and evidence based treatments for PTS and TBI. Despite these efforts, it is not known whether the trainings actually create a new pipeline of providers or impact the quality of care. Therefore, standards must be created to equip and motivate the existing healthcare workforce to recognize the signs and symptoms associated with the invisible wounds of war, refer patients to appropriate sources of treatment and care, and adhere to clinical practice guidelines, evidence-based approaches, and performance based care. As organizations develop their approach to comprehensive, high quality care, they will begin to develop best practices that lead to innovative therapeutic approaches. The development and sharing of these best practices will begin to improve the standards of care in the treatment of PTS and TBI, utilizing both evidence-based medicine and non-traditional treatment methods. These standards will allow for the development and dissemination of evidence-based guidelines and encourage a stronger integration between these approaches. General Pete Chiarelli, CEO of One Mind, outlines advances made in research. In order to get more warriors into effective care for the invisible wounds, we must promote research funding streams, and connections within the research community, that improve the diagnostic tools for PTS and TBI, as well as therapeutic approaches that are inclusive of non-traditional solutions. Improving Diagnosis and Treatment through Research. We must build upon the National Research Action Plan to craft and disseminate a strategic research, and work toward more efficient translation and implementation of findings into practice. Continuing to monitor the effectiveness of these therapies over time will improve the understanding of the impact of the invisible wounds of war and ensure ongoing success. Healthy relationships include the ability to experience and express emotion, understand and provide for the needs of a loved one, and act on another’s needs. Invisible wounds can interfere with these behaviors and contribute to marital dissatisfaction, higher rates of marital distress, higher rates of divorce, and can even impact children. Over the past decade, significant efforts have been taken to increase awareness of the invisible wounds of war. Federally sponsored public education campaigns, such as the DoD Real Warrior Campaign and VA Make the Connection, have been launched to help raise awareness about the signs and symptoms of these wounds and conditions and to decrease the stigma associated with them. But more must be done. Empower Veterans, Caregivers, and Communities to Recognize and Address the Invisible Wounds of War. It is critical to promote accurate, empathetic understanding of the invisible wounds of war and decrease stigma. Too often, warriors with the invisible wound of war are portrayed as a danger to themselves or their communities. Public awareness campaigns have provided information and resources to help veterans, service providers, and family members to recognize the need for help and locate care in their community. Similar efforts in local communities and the private sector have also been launched. But more is needed. Building a community that is more aware, empathetic and willing to take action will require additional efforts to educate, inform, and motivate individuals, organizations, and service providers to recognize the need among veterans with invisible wounds of war and to address them. Synchronizing efforts to educate the general public and about the nature and symptoms of invisible wounds, correct misperceptions, reduce stigma, and adding initiatives that empower veterans and their caregivers to get connected to high quality care, will measurably improve that effort. "Our warriors are the one percent of America who kept the 99 percent safe. We have a duty to help make their transitions as successful as possible." America can never fully repay our veterans, but we must try. We should recognize that service in the military is a source of training, skills and values that prepare our veterans to succeed in civilian life. By supporting and enabling our Nation’s warriors in their new missions, we unleash the vast potential of a generation of resourceful, determined, and experienced leaders—for the good of our veterans, their families and communities, and our country. Knowing our veterans and understanding issues like the invisible wounds of war are the first steps to honoring the service and sacrifice of those who wear our Nation’s uniform. Change the way you think about the invisible wounds of war: post-traumatic stress and traumatic brain injury. Eliminate any pre-conceived notions or stigmas. Understand that with effective treatment and support, these injuries can be overcome. 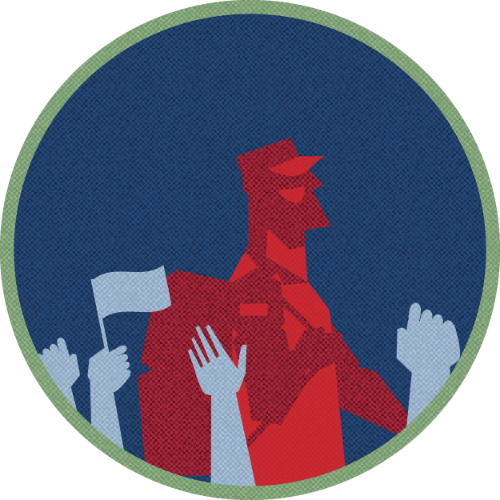 Take the time to understand the issues facing veterans in your community, and share what you learn with others. Learn about and support -- with your time or your money—effective organizations that help veterans. 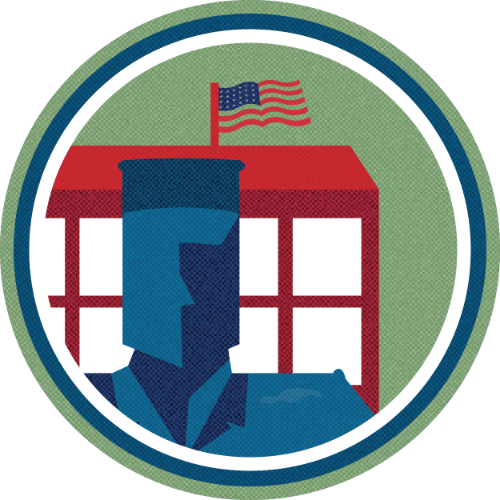 If you know a veteran who is transitioning out of military service and needs support, encourage them to visit bushcenter.org to find helpful resources. The Invisible Wounds of WarThe Warrior Wellness Alliance connects veterans to high-quality care. EmploymentThe VET Roadmap helps warriors transition from military service to civilian employment. 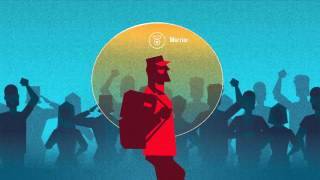 Collective ImpactTools for the nonprofit community and the warriors they serve. #KnowOurVetsLearn more about the unique challenges facing our warriors.